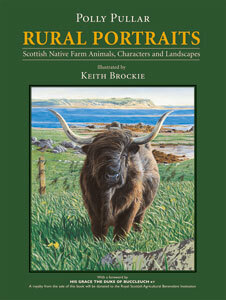 This magnificent journey around every breed of Scottish native farm animal portrays in words and pictures, the essence of rural life, its wildlife, people, places and unsurpassed landscapes. Polly Pullar’s writing is clear, informative, and full of anecdotal humour. Her vivid images of landscape and the sights and sounds of nature are perfectly complimented by the detailed illustrations of Internationally renowned artist Keith Brockie. The book seems to be a labour of love…..It is some of these livestock breeders, the passion they have and the fun, interest and excitement they get from a job which also tends to be their hobby and their life, that Polly Pullar depicts so well……this is matched by Keith Brockie’s paintings and drawings. This is a book of surprises-all nice ones. Nothing like it has ever been done before. It is a unique record of Scotland’s native breeds of farm livestock and much more. It vividly portrays with pen and paint, choice views of rural life throughout the whole country, including the native breeds, associated landscapes, wildlife and colourful human characters.